Antique Extending Tables were basically a dining table that would extend into different lengths using a draw leaf or wind out mechanism. This would usually start as a smaller sized oval or square, 4 to 6 seater and could extend up-to a large rectangular 12 – 20 seater dependant on the design. This type of table was first introduced in the Georgian period, whereby two console tables would attach onto a central drop leaf table held using brass D clips. The Regency period, introduced the more well known extending table where a central leaf can be added in the middle but this was done by a draw leaf action, meaning two people was needed to pull it open. This was not easy to open and shut, so the Victorian Cabinet maker improved on this idea by adding a corkscrew mechanism, so it was easily extended using a winding handle. This was called the Wind Out Table, and is the most popular form of table sold today as they are so useful, versatile and easy to use. They were mainly built with four solid turned legs, in woods like Mahogany or Oak, usually with beech or Walnut sliding rails on the underside. Have a look below at our lovely examples available for sale. below are some examples of tables that we have sold previously, let us know if any particular design looks of interest. Large Georgian Antique Mahogany Extending Dining Table. Dating from around 1800 this beautiful large Georgian antique dining table is made from mahogany. It consists of two side tables with drop leaves that when lifted join together and, with the addition of the extra leaf, become a large dining table. With the various configurations possible it is a very versatile piece and would fittingly grace any dining room. 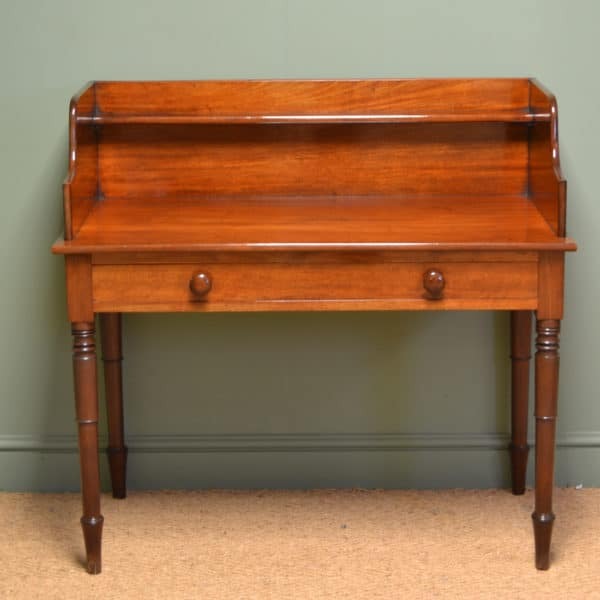 The solid mahogany top is beautifully figured and stands on eight elegantly shaped legs with pad feet. The gate leg action of the internal legs allows easy access for chairs when fully extended. This antique dining table has been later adapted to this very unique and practical design. 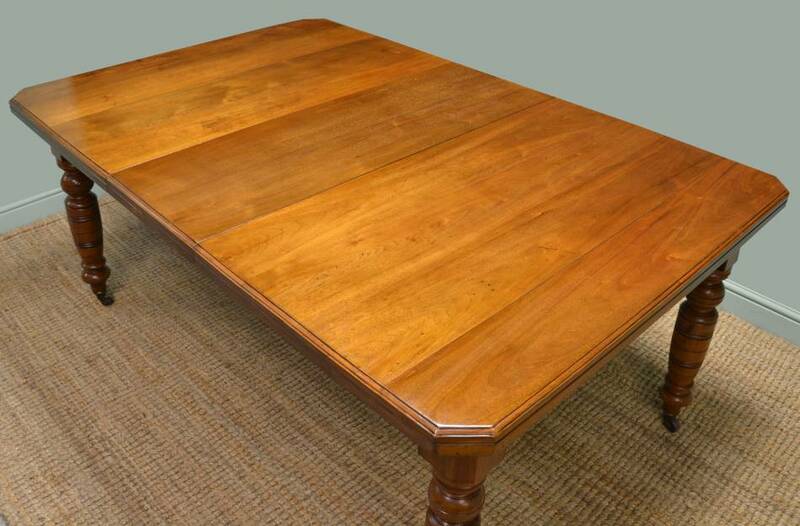 Large Golden Oak Extending Wind-Out Antique Dining Table. 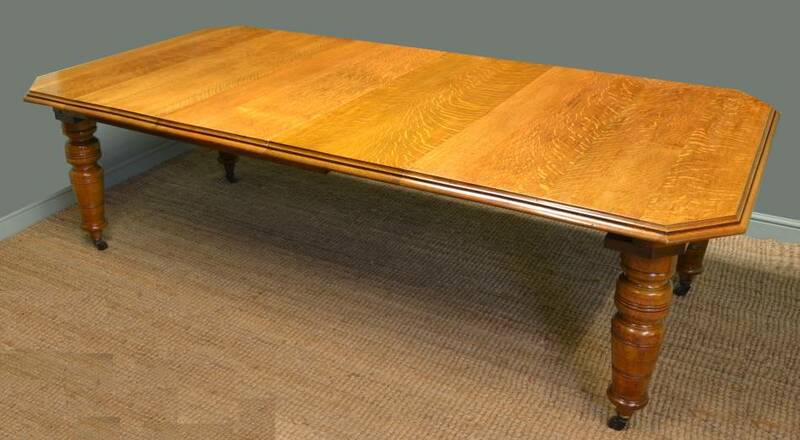 Dating from around 1880 in the Victorian period this antique wind-out dining table is a fabulous golden shade of oak. It oozes quality and maintains a real ‘presence’ in a room, definitely a statement piece. It has two central removable leaves, winding handle and wind-out mechanism. The top is made from solid oak with beautiful figuring, moulded edges and canted corners. It stands on four chunky turned legs with brown porcelain castors and is in super condition. The oak displays a fabulous golden tone with a striking grain, good patina, is in very good condition and has been beautifully cleaned using a traditional form of wax finishing. 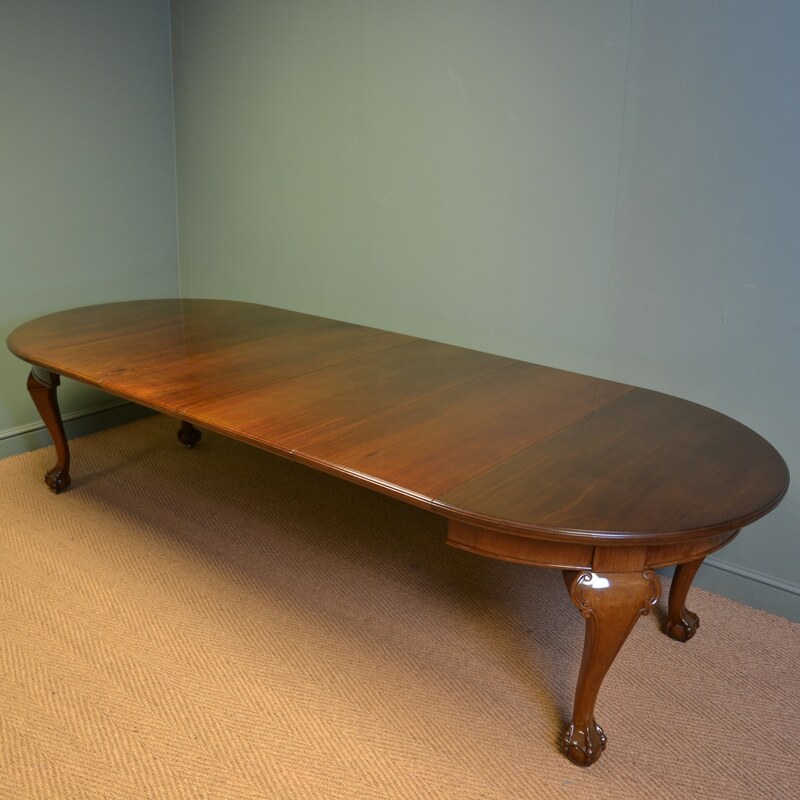 Large, Victorian Walnut, Extending Antique Dining Table. 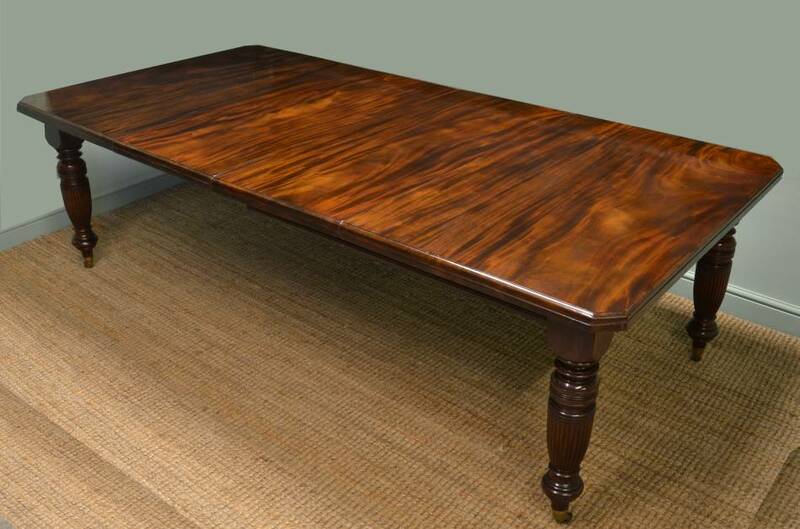 Dating from around 1880 in the Victorian period this large antique walnut wind-out dining table has a fabulously grained top. This quality piece has two central removable leaves, winding handle and wind-out mechanism. The top is made from solid walnut with a moulded edge, canted corners and displays the most beautiful figuring. It is supported by four delightfully turned reeded legs which stand on quality brass cup castors. It is in super condition for its age and would easily accommodate ten to twelve diners. 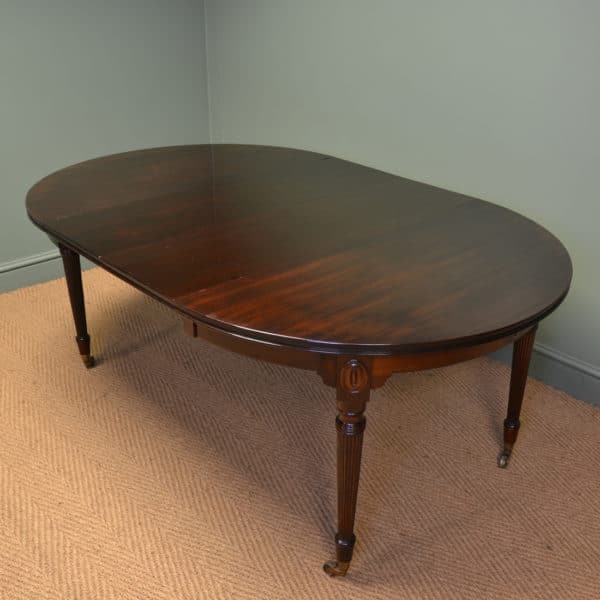 Large Regency Mahogany Extending Antique Dining Table. 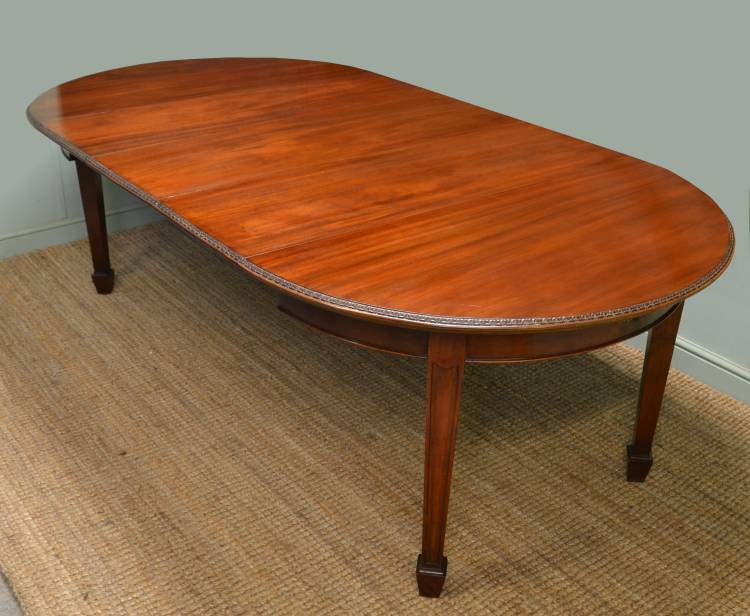 This very impressive antique Regency mahogany dining Table dates from around 1830. 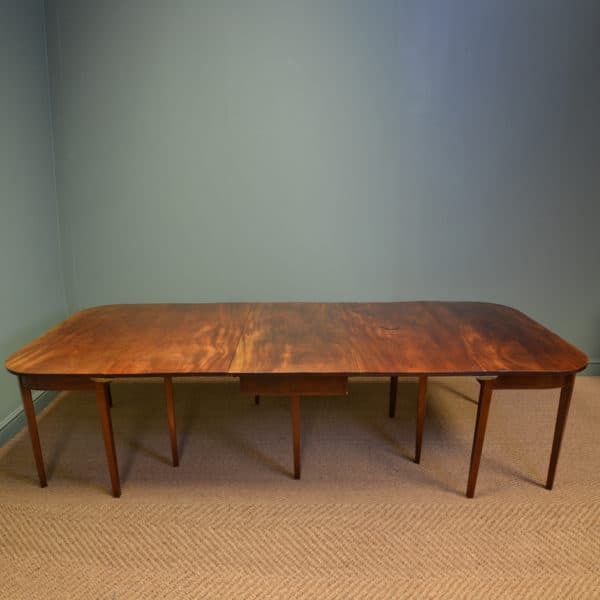 It has a solid mahogany top with rounded corners and a moulded edge along with two central removable leaves. A deep apron skirts the two console ends and sits above the eight beautifully turned reeded legs that support the entire table. The legs are finished with brass cup castors and four of the legs are set back from the edge allowing chairs to seat comfortably at the table without restriction. Not only can the dining table be used as two separate, and very attractive, console tables when not in use, it is also large enough to seat ten – twelve people when fully extended. Ideal for those special occasions! 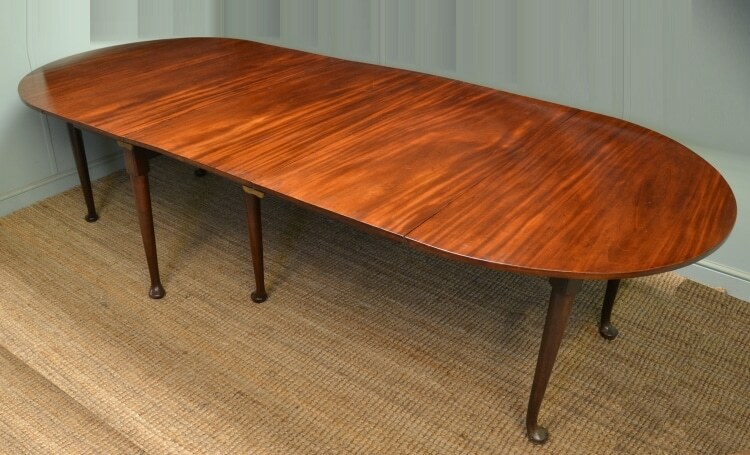 Victorian Walnut Extending Antique Dining Table. Dating from around 1880 in the Victorian period this antique walnut extending dining table is the ideal size for most homes. It consists of a single central removable leaf and comes complete with a winding handle and winding mechanism. The top itself is made of solid walnut, has moulded edges and canted corners. It stands on four beautifully turned legs which are finished with brown porcelain castors. A great, practical table with the character expected in an antique. Antique Victorian Oak Extending Dining Table. 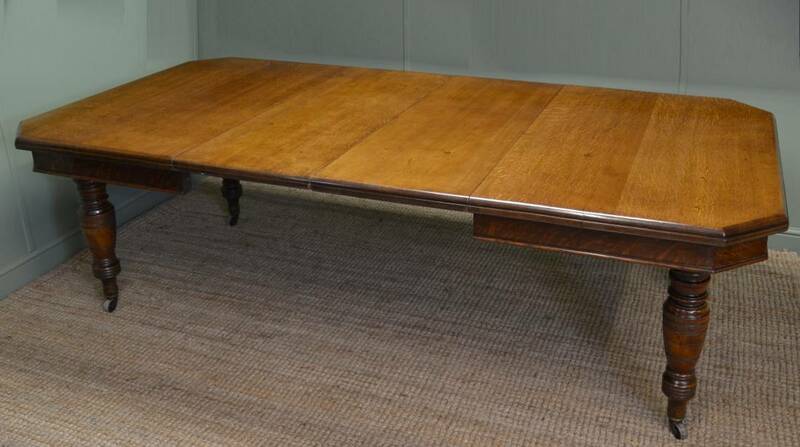 Dating from around 1880 this beautiful Victorian Oak Extending Dining Table also benefits from the ability to extend. It comes complete with a winding handle, winding mechanism and two central removable leaves making it very versatile with regard to length options. The top is made from solid oak and has canted corners and a moulded edge. The table is supported by four beautifully turned legs with black porcelain castors. 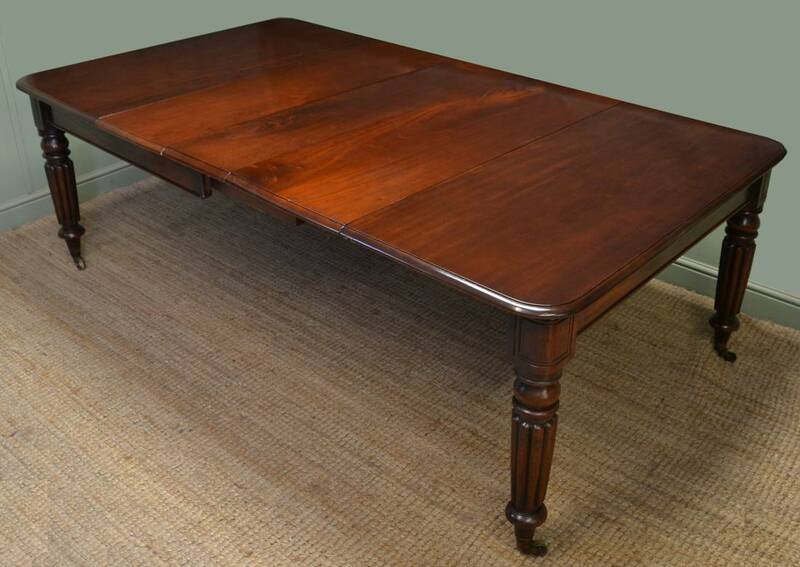 Quality Regency Mahogany Antique Extending Draw Leaf Dining Table. 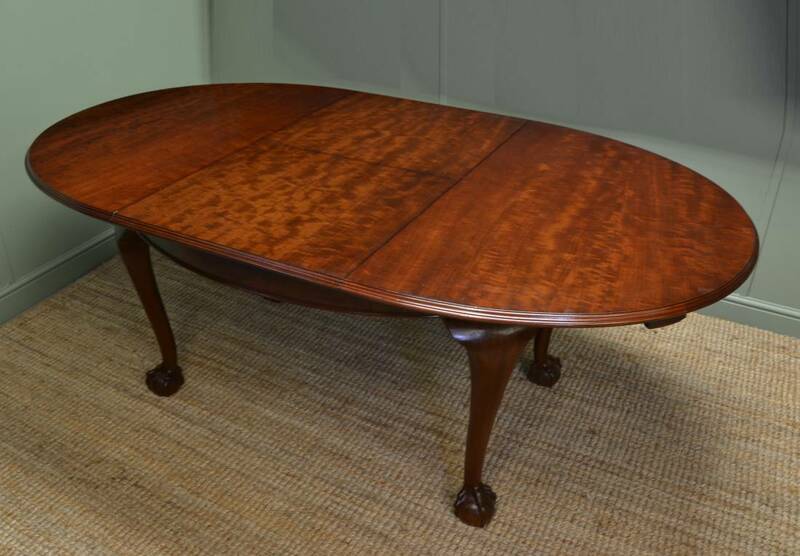 This quality mahogany antique dining table dates from the Regency period, circa 1830, and extends using a draw leaf motion. The top is made of solid mahogany with moulded edges, rounded corners and has three removable leaves. When closed the table is held securely together by way of the original brass ‘D’ clips. 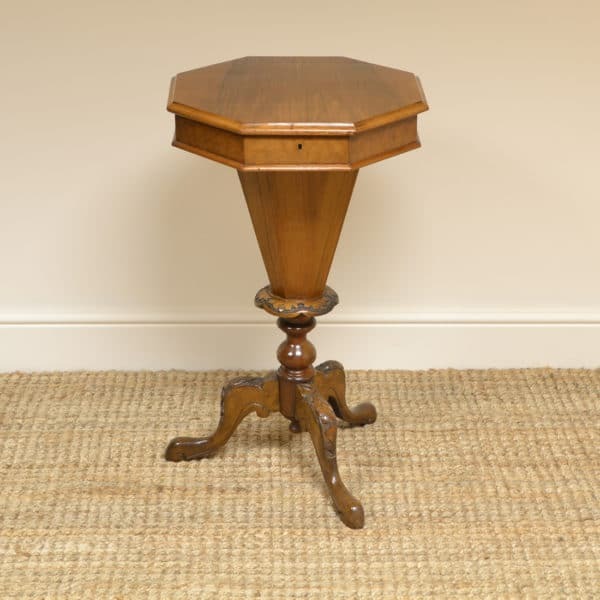 It stands on beautifully turned, reeded legs which are finished with brass cup castors. 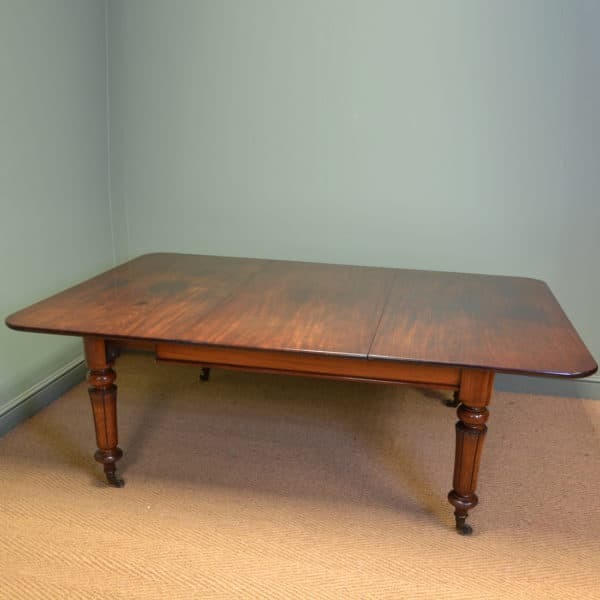 Gillows, Edwardian Mahogany Antique Extending Dining Table. 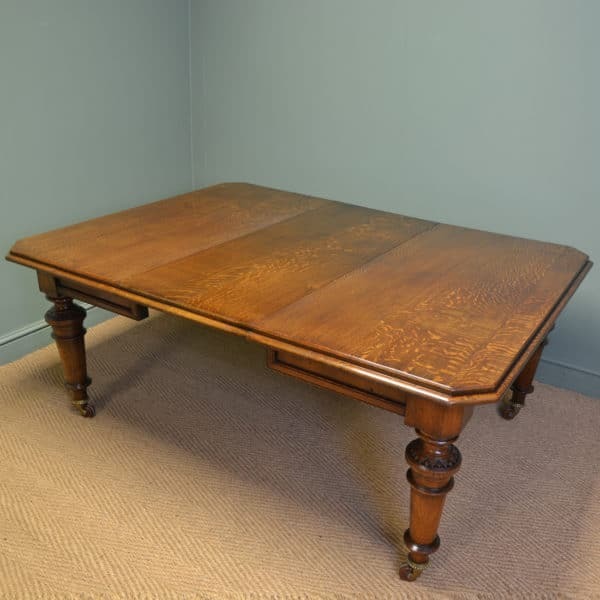 This mahogany antique extending dining table dates from around 1900 in the Edwardian period and still bears the original makers stamp of Waring & Gillows of Liverpool. The top has a decorative moulded edge with three central removable leaves and comes complete with winding handle and winding mechanism (stamped by the renowned ‘Joseph Fitter’). 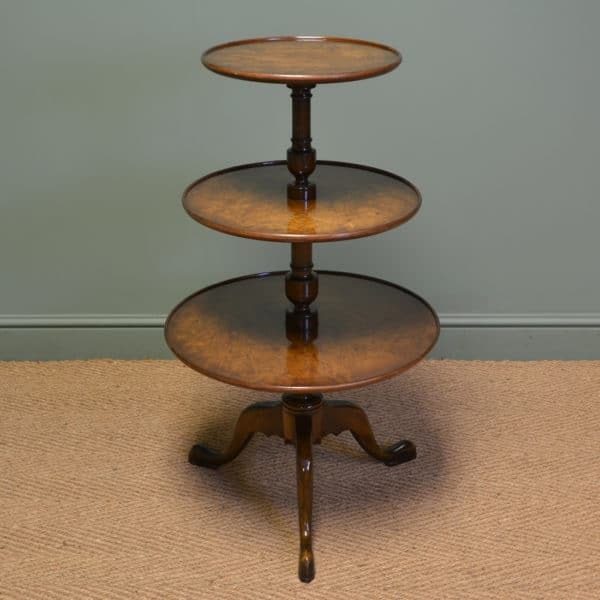 It stands on four elegantly tapering moulded legs with spade feet and is a rich warm shade of mahogany. 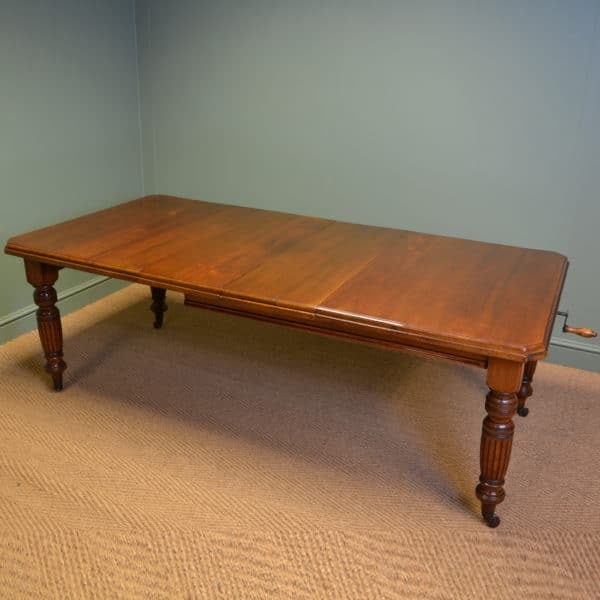 This quality antique dining table is extremely flexible for seating plans, being able to close down to a very practical table for four or extend up to very comfortable table for eight or even ten for those special occasions. 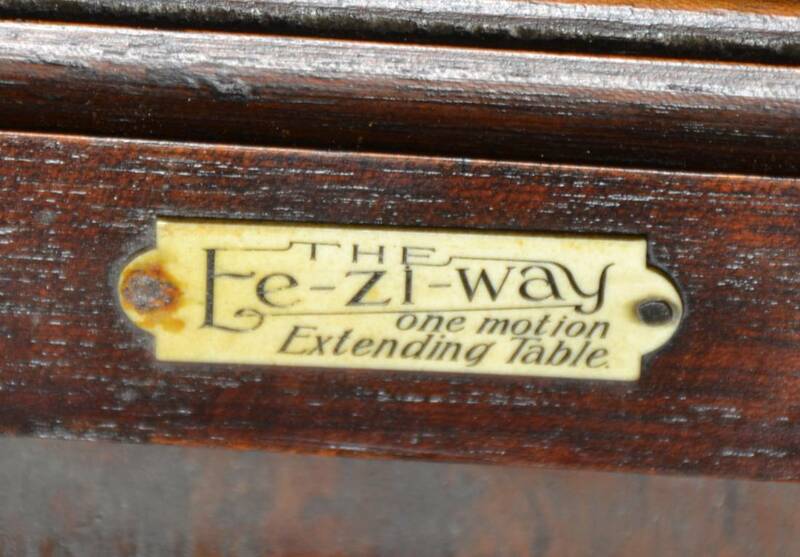 This antique mahogany oval dining table dates from the 1920’s and extends using the “Ee-Zi-Way one motion” mechanism. The beautifully figured oval top has a moulded edge and contains a central leaf that folds away beneath the table, it still retains the ivorine label reading ‘ The Ee-Zi-Way One Motion Extending Dining Table’.